The year was 1699, a young explorer named Jean Baptiste Le Moyne Sieur de Bienville landed sixty miles south of the land where New Orleans now stands. Back then, he named the site Pointe du Mardi Gras, on the holiday's eve, and seemed fitting for his discovery. The first American Mardi Gras was celebrated in 1703. In 1718, New Orleans was proudly established, and Mardi Gras was an annual celebration by the 1730's. Before the parades as American knows them today started, Mardi Gras involved elegant balls and high society. It was not until the 1830s that New Orleans started holding street processions, masked parade attendees, and gaslight torches to enhance the romance and festivity. In 1873, parade displays were made in New Orleans, changing the norm of having everything made in France. The Governor at the time, Governor Wormoth, effectively signed an act that made Mardi Gras an official holiday. Mardi Gras is known for its music, parades, picnics, floats, and excitement. People wear costumes, dress in purple, green, and gold, and drape themselves in beads. Families flood the streets, everyone dresses up, and both visitors and locals have a great time. People watching the parades throw balls, collect beads, play music, eat food, and mingle. Most businesses shut down on Mardi Gras day to enjoy the celebration. Do not forget to bring a bag to collect all of the trinkets thrown from parade floats. Mardi Gras always falls on the Tuesday before Ash Wednesday. Most visitors arrive the weekend before Mardi Gras to enjoy an extended weekend of festivities and the most popular parades such as Endymion, Bacchus, and Rex. Endymion is named for the mortal in Greek mythology for whom Zeus granted immortality. In 1967, this parade became so famous that observers start snagging spots on the street early in the morning, despite the fact that the parade does not start until the evening. It is estimated that this parade tosses more than fifteen million throws. 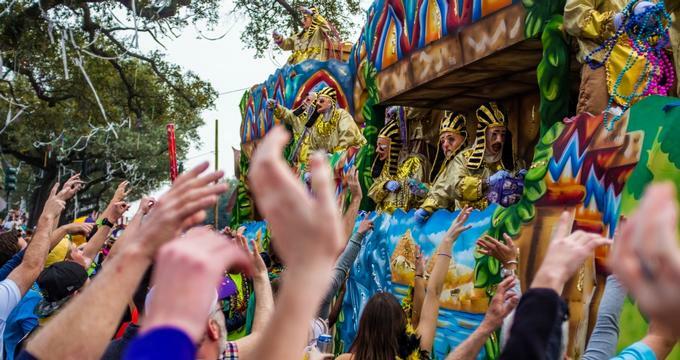 When the Krewe of Bacchus was founded in 1968, it broke Carnival tradition by staging a Sunday night parade with bigger and more spectacular floats than any other parade at Mardi Gras. Now, the Krewe of Bacchus is one of the most revered parades in Carnival history. With more than thirty-one animated floats, this parade has Las Vegas-type entertainment, dancers, and celebrity appearances as Bacchus, the Greek god of wine. The Krewe of Rex resists the use of technology in their parade with elaborately hand-painted floats. The originators of Carnival colors gold, green, and purple, they have held more parades than any other organization in Mardi Gras history. They are the oldest participating group in Mardi Gras and hold fast to the traditions of the holiday as they parade through the streets. There is more to Mardi Gras than parades. Many other attractions await visitors and offer historical views of the traditions, food, and fame. Kern Studios builds breathtaking floats that fill the streets in parades and celebrations. Visitors can see how Mardi Gras comes to life at Mardi Gras World, tour the massive studios where floats originate, and dress up in costumes to each King Cake. Watch historic videos and eat New Orleans food year-round at the on-site cafe with a view of the Mississippi River. Germaine Cazenave Wells Mardi Gras Museum features Mardi Gras Carnival attire and other French memorabilia. It is an excellent place for visitors to go back in time and see where the traditions started. Antoine’s Restaurant lines its walls with celebrity visitors and is lavishly decorated in green and gold. The restaurant encourages reservations to ensure visitors enjoy their dining experience. Antoine’s is an exclusive experience requiring a strict dress code, and 175 years of tradition come together for an unforgettable meal. The Steamboat Natchez provides a buffet-style Creole dinner with classic dishes like fried fish, Creole creamed spinach, and bread pudding with white chocolate sauce. Diners enjoy live music and a unique dining experience cruising on the Mighty Mississippi. During Mardi Gras, visitors can get everything they need at a variety of shops. Beads by the Dozen sells hats, masks, toys, and beads. The Mask Store carries masks from the best local artists, and if visitors do not find the perfect fit, The Mask Store will make custom pieces to suit. Mardi Gras is a celebration of epic proportions, with food, toys, and parades to match. Visitors have so much to choose from in so little time, that they come back year after year to experience the fun in a new way every time.